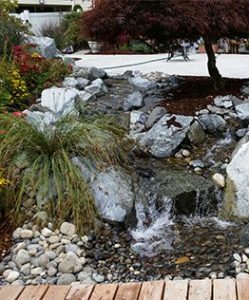 Hone Landscape Company offers Snoqualmie landscaping including both new landscape installation and landscape renovation. Customers choose us to install professional landscaping in Snoqualmie for many different reasons. Sometimes we renovate and transform landscapes for new homeowners who want to make an older yard their own. In addition, many clients update and change their landscape to make it more usable or enjoyable. And of course, many homeowners hire our team after they buy a new a construction home. In any event, whatever your landscaping needs may be, we’re the right choice. Our professional crews handle every aspect of your job. First, we provide the basics of grading, contouring, and irrigation systems. Next, we construct patios, walkways, driveways, retaining walls, and fencing, Finally, we install lighting, lawn, trees, and plantings as the finishing touches in beautiful yard. You’ll find that our crews have an excellent working knowledge of all aspects of landscape construction. As a result, you can relax knowing that one call to us can take care of it all. The Hone Landscape team uses materials like pavers, rock, flagstone, and stamped concrete to build beautiful sidewalks, patios and driveways. Also, rock outcroppings are an attractive option when adding steps and other interesting features in an outdoor area. A retaining wall can be a structural wall, but it can also be a great way to add visual interest to your project. That’s why we specialize in using stone blocks, rock, and other materials to create walls in yards and gardens. In addition, we engineer structural walls to meet your needs. We provide our professional experience creating and constructing drainage solutions that can solve problems like soggy yards, buildings, and parking lots. Our team provides environmental solutions like construction impact mitigation services for construction zones and natural areas. We want to learn more about your landscape project in Snoqualmie. And remember, our estimates are always free. So call Hone Landscape Company at 425-549-0185 or contact us online.